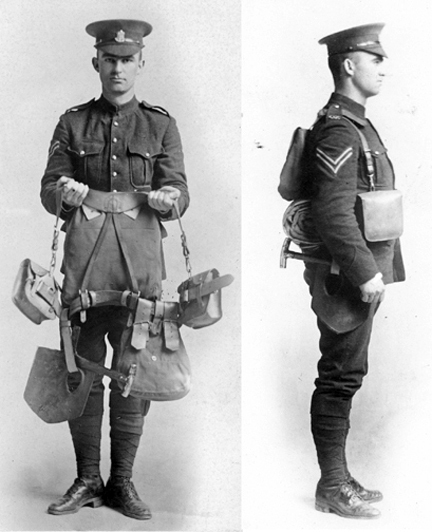 The provision of equipment with which to outfit a complete division of soldiers for the Canadian Expeditionary Force (CEF) proved to be a challenge for its small cadre of professional soldiers. The pre-war Militia attempted to mirror the British Army in many respects but was unable to invest the money required. At the same time, the Canadian Militia attempted to set a distinct Canadian style which resulted in significant differences between the soldiers of Britain and those of Canada. 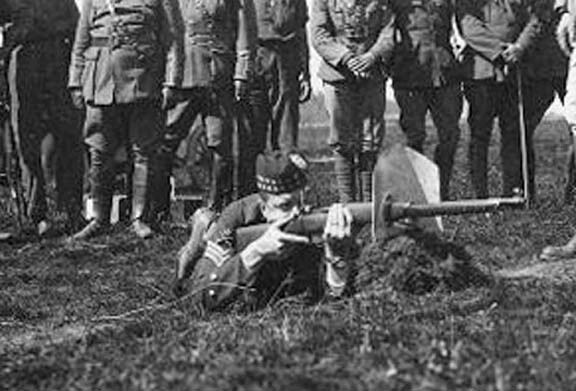 Best known amongst these were: the adoption of the Ross rifle in lieu of the British Enfield SMLE, the use of a different pattern khaki service dress uniform, and leather Oliver Pattern load-bearing equipment. With mobilization came the need for a variety of other equipments which had previously been neglected by Ottawa, including a suitable entrenching tool. The Minister of Militia, Colonel Sam Hughes, addressed this item by supporting the adoption of a combination shovel and shield – a suggestion initially made by Ena MacAdam, his personal secretary, who had witnessed Swiss soldiers constructing front line fortifications in France with a similar tool. Top, The MacAdam shovel with the short handle pivoted for carry. The spike was meant to support the shield but this proved impractical and the hole was found to be too low to permit accurate sighting. Bottom, With the handle in battery for digging. On 3 September, 1914, Hughes submitted a recommendation for the purchase of 25,000 shovels from the Midvale Steel Company, of Philadelphia. The specifications show the shovel to be 8 1/2 inches wide and 9 3/4 inches long with a 1 1/2 inch curvature. Each blade was to feature a 3 1/4 x 2 inch hole on the left side (of the concave). The contract called for an integral handle, 4 inches long and tapering from 2 inches to 5/8 inch. The price quoted by Midvale was $1.35 per shovel and delivery was promised within 3 weeks. The submission identified that the shovels were to be 3/16 inch thick and capable of ‘resisting’ three shots from a US Springfield and Ross Mk III ammunition. Midvale was to test one of every 100 shovels. In total, the MacAdam shield- shovel weighed 5 pounds 4 ounces. Demonstrating the MacAdam to the Minister of Defence and Staff officers at Connaught Range, Ottawa. Alderson states our shovels tried as shields but not found satisfactory. Trenching tools issued our troops. Could not carry our shovels in addition so they were left behind. Lt-General E.A.H. 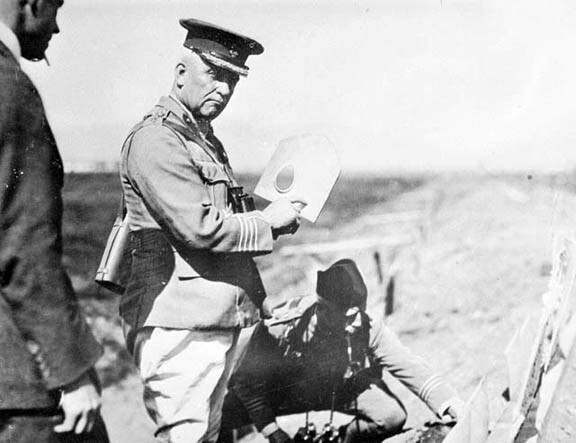 Alderson, was the General Officer Commanding the 1st Canadian Division. A professional soldier he was selected as he had previously commanded Canadians in South Africa, however, there was little love lost between Carson and Alderson. No authority given anyone purchase other shovels [this] order must be cancelled and Canadian shovels used[.] you must hold a tight hand on all that improper work over there[.] promptly cancel order for English entrenching tools[.] see General Alderson and if necessary Earl Kitchener but I will not permit this improper interference[.] British entrenching tool absolutely useless for any purpose[.] ours perfect for protection and with handle attached is excellent for shovelling (sic)[.] collect every Canadian shovel and have handles attached thereto[.] man sent over with handles to do the work please act promptly. Only five battalions were in possession of Web equipment, remaining battalions having Oliver equipment, which had no pack or facilities for carrying the entrenching implement and were therefore completed with Web before embarkation. Hughes was not one to accept this decision at face value and continued to argue in favour of ‘his’ shovel. 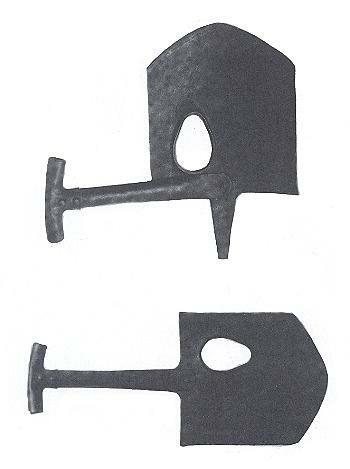 In fact, in March of 1915 (3 weeks after being advised that the CEF had sailed for France with British entrenching tools and that the Canadian shovels had been left behind) approval was sought, and obtained, to order the manufacture of 25,000 handles from the Nova Scotia Steel Company, at a total cost of $3,800. Unfortunately, the records are silent on whether these were manufactured and, if so, delivered to the UK. 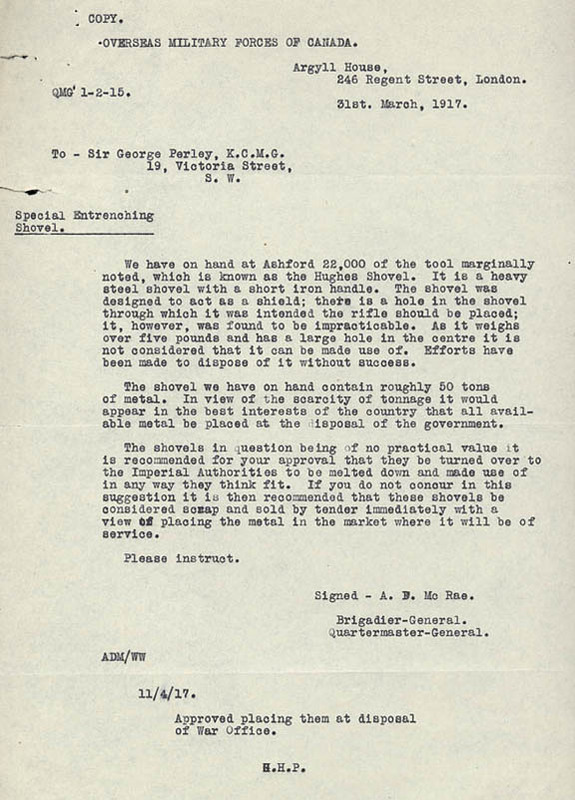 In 1917 the British War Office sought approval from Canada to dispose of the shovels as they represented 50 tons of steel, a valuable wartime commodity, and in early April Canada agreed to dispose of these to the War Office. The surviving 22,000 shovels which had cost the government over $29,000 was sold off as scrap in 1917 for $1,400. Few of these shovels have survived although it is believed that an example exists in the collection of the Imperial War Museum as well as with the Royal Winnipeg Rifles museum. 1. Ronald G. Haycock, Sam Hughes: The Public Career of a Controversial Canadian, 1885-1916 (Toronto: Wilfrid Laurier University Press, 1986). 3. Rawling, William, Surviving Trench Warfare.